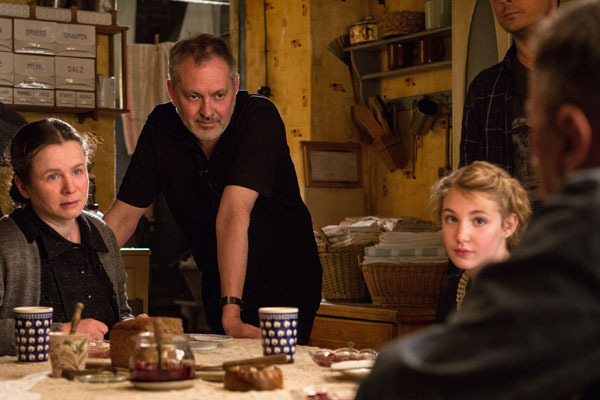 Director Brian Percival rehearses on set with actors Emily Watson, Sophie Nélisse and Geoffrey Rush [back to camera]. Photo by Jules Heath ©2013 Twentieth Century Fox. All Rights Reserved. Photo ©2013 Twentieth Century Fox. All Rights Reserved. 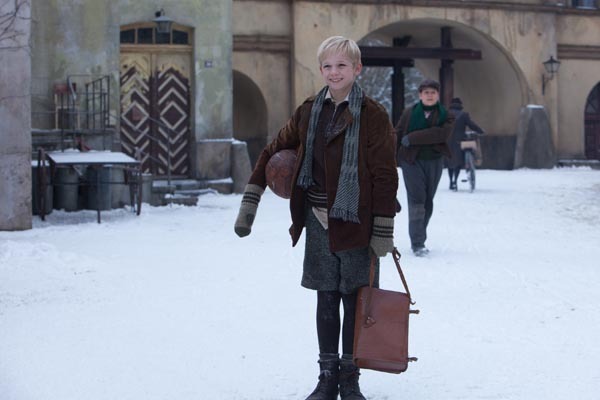 The story of a girl’s discovery of the power of words and the human spirit, THE BOOK THIEF, a novel of international renown appearing on The New York Times bestseller list for over 6 years, was lovingly translated onto the big screen by Director Brian Percival and his production team, including Director of Photography Florian Ballhaus, Production Designer Simon Elliott and Set Decorator Mark Rosinski. 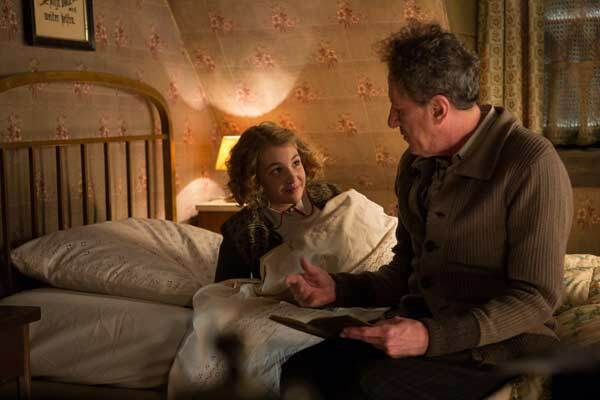 An impoverished child, Liesel [Sophie Nélisse], is taken in by foster parents Hans and Rosa Hubermann [Geoffrey Rush, Emily Watson] who live in a small town in Germany during the outset of World War II. The illiterate girl has scooped up a gravedigger’s dropped book at her younger brother’s funeral. This small theft inspires her to learn to read and instills a love of books and the words that create them. She, in turn, inspires all who come to know her. SET DECOR: Could you please talk about bringing a book to life visually?? 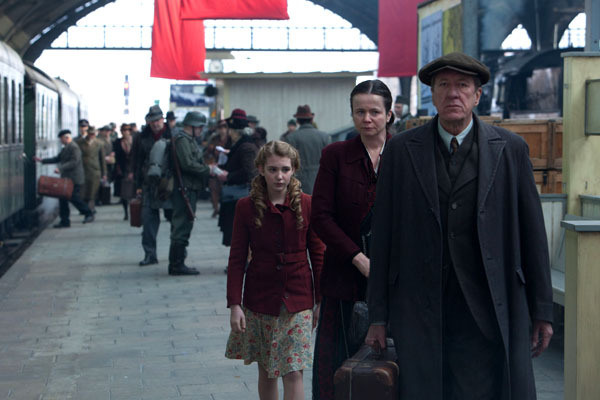 Director Brian Percival: Well, I think in many ways we were quite fortunate, because with THE BOOK THIEF, we have a 580 page instruction manual on how to make the perfect film…it’s all there for us. So if we’re not sure about a character or the way something looks, we can always refer back to the novel. You don’t embark upon an adaptation unless you are really moved by the source material. At least, I don’t anyway. So generally I try to be as true to the original intention as possible, because that’s what made me like it in the first place. [He smiles.] I just feel there is a sense of duty to the original author who created the piece that moved one so much to want to bring it to a wider audience or bring it to the big screen. It’s a responsibility, but not something I find difficult. SET DECOR: The way you depicted it…that evil behind the innocence…was very telling. This film seems to have a simplicity, but a depth at the same time. Percival: Yes, that’s right. That was my intention. You know, you can read the film on many levels, and I think that’s the way it should be. Hopefully it will stay with you and maybe you’ll see something on a much deeper level that will come through later. But foremost, it should be accessible. It should be painted to a wider audience, because it’s such a great message that Markus Zusak created and I wanted that to reach as many people as possible. The images in the film reflect the innocence and humble nature of the story we are telling. I think the most interesting films and shows to watch, are when you can enjoy something on a basic storytelling level and enjoy the characters, and then the deeper you look, there are more things to discover. SET DECOR: As in the set decoration, a lot of it is detail to give background to character or place. Could you talk about that? Percival: Absolutely. You know, it’s so important for the actors as well, particularly with Geoffrey and Emily. Emily is really quite method. She goes into a character and stays in it all day, and Geoffrey has a different approach, where he can sort of fool around in between takes. It’s fascinating to watch different actors, here two great, great actors, with such different approaches. I very much wanted the cast to have ownership of the set, for it to feel as real and natural as possible, where the actors as their characters would feel comfortable. The set really helps in establishing the foundations of the characters, the creation of the characters. I remember we had about a 40-minute conversation one morning about the right sort of mop they’d use in the basement. It’s really a fascinating thing to do, because it shows the level of commitment by everyone to get all the details right for the characters. SET DECOR: Exactly. And you mentioned the basement. There is the incredible expanding vocabulary painted on the walls…that visual presence of words. For a simple but powerful detail like that, did you go through figuring out fonts, styles of writing? Did you know right away? Percival: First off, it was all with Simon Elliott to create a set that I never had to go back to the same angles for shooting. I don’t think we ever really used the same choreography, the same angles in two scenes. I was always allowed to be able to shoot from different places. I asked him to design it in a way so that all the walls could come out, which allowed me to shoot with longer lenses, so we didn’t feel uncomfortable and so claustrophobic all the time. We never got bored with that basement. Percival: Yes, they were very good about all those details! I think it’s details that really make a film. It’s not always something people notice straight off, but it adds a lot of depth to the film. 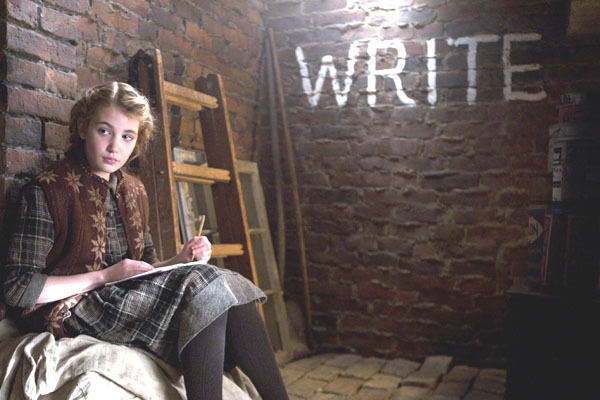 For instance, the writing on the walls…we sourced what would have been the style of German handwriting at that time. It’s almost like a heavy Gothic script, and so we had to adapt it. First, we adapted it in German. And then, there is always this quandary in doing a film which is supposedly in another language, “Does it seem odd that she was writing German words on the walls, but speaking English?” So we had to sort of say, “Well okay, the rule that we’ll make for this is that she will write the words in English, but the signage in the streets will be in German.” There are obviously some times that you have to make up rules as to the ways something will be done and then stick to them. Percival: It did, it does. You don’t really question it, whereas had the street signs been in English, you might have. All those details…there were a lot of things in that basement, but all had a foundation in realism, things that would have been of some use to that family. I mean, sometimes you see something dressed in because it looks good. But, it should have a place in the lives of the people, the characters in the film, and not just to be placed somewhere because it breaks up a shot well or just because it looks good. 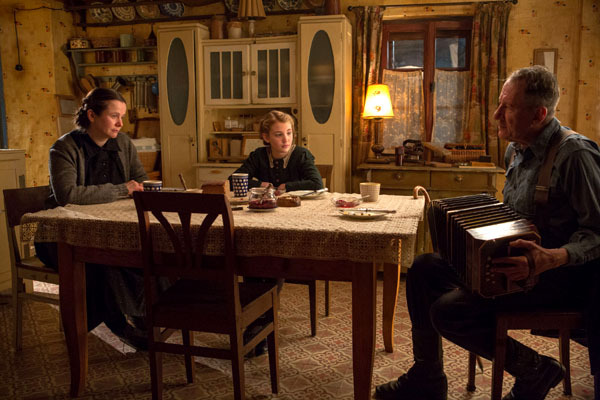 SET DECOR: Yes, and in this case Hans’s painting tools, such as the canvas tarps and paint cloths…the textures throughout that home, from those to the linens to the blankets…the textures were amazing. 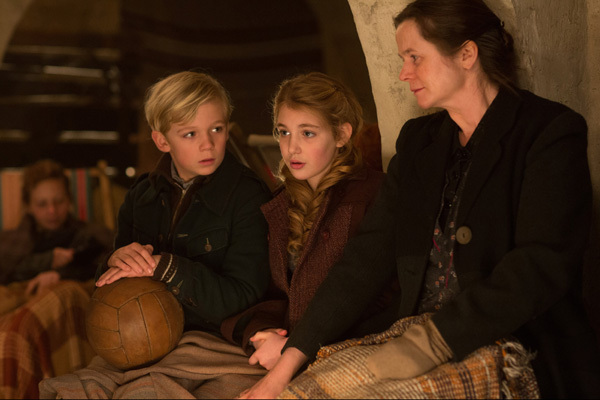 Percival: I’m glad you noticed that, because there were so many scenes where just the texture in the material of the pillowcase really added something, like scenes with Max and Liesel at night when they talk to each other from their respective beds, or when Hans is talking to Liesel. There’s a warmth, a personal aspect portrayed. I never wanted to make it somber in any way. There’s always that feeling of hope, of positivity, despite what is going on. It was important to not to make it colorful, but to make it rich. So we came up with this palette which had really rich colors that had a depth to them. It’s quite an impoverished life, there’s nothing at all privileged about it. They make do with what they’ve got, but we should try within the film to make that very rich. SET DECOR: It comes across as they value what they have. It may not be much, but it is lovingly cared for. We see the wear, for instance, on the linen but Rosa is a good homemaker, so the linens and even the curtains on the windows are cleaned and pressed regularly. Percival: That’s right! You know, I grew up sort of in the streets of Liverpool. It was a small community full of people who really didn’t have much. They were quite impoverished, really, but they had a great deal of pride and a great strength. Those are the values I wanted to transmit and to communicate. And the way in which everybody…Simon, Mark and our terrific costume designer Anna Sheppard… achieved that was just wonderful. SET DECOR: Himmel Strasse seems to reflect that as well. Could we talk about the exteriors, how the town and the street dressing reflected the changing times…and the story’s themes? Percival: We were determined to find the right town in southern Germany, so it would feel as real as possible, but it just wasn’t happening. Because so much of this story takes place in the street, I wanted to constantly shoot it in a different way, not looking back from the same angles over and over. By building the set, there were many sight lines we worked out, which offered any number of different ways that I could shoot the exterior of the house without having to repeat myself. That was key to it really. Something else that entered into the equation was the fact that there often might be snow and we’d need an interior set nearby to go to when the weather turned. Of course, the other big thing was, we actually had to destroy this town in the end, because that’s the story. So taking all those things in to consideration, we decided that the best option would be to build at Babelsberg Studios in Berlin. 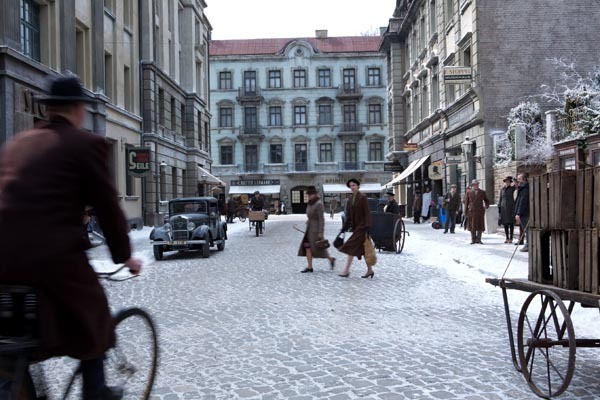 There were some existing streets on the backlot, which we changed into the main unit of the town. The German crew which we had aboard said it was the most effective use of the street that they had seen, this great, wonderful little small town. We completely built Himmel Strasse [Heaven Street]. Simon said to me, “Well the problem is that when most people shoot on a backlot, it all tends to be flat, and that’s what makes it feel like a backlot.” So he created a hill at one end of it, up beyond the cobbled street, which turned out to be terrific. The street was home to so many people, it got to be kind of cozy, and it became a character in its own way. SET DECOR: There was evidence of the larger world invading more and more. 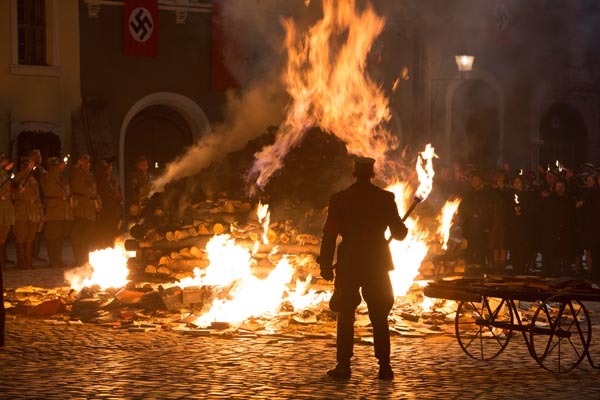 There were changes in the shop windows, and then the actual events, from the book burning to the Kristalnacht-like treatment of the Jewish-owned businesses, and then the bombing and the rubble. Percival: Yes, throughout the film, we had this transition that the street went through where there would be less and less things in the shops. And the men would gradually disappear. Eventually we would be left with only the people who weren’t being called to war. We charted that throughout the devolution of the street. Eventually, we went away to film in Meisen for about 10 days, to some location sets. When we came back, Simon and Mark and their crews had destroyed “Himmel Street” in the meantime, just as it had been bombed in the story. And it was actually quite sad for us. We had had a great couple of months of filming on these sets and we really got to love them. Again, it was almost like another character in the film, and here it’s taken away from us, and we were left with this very visible destruction. Percival: Yes. The actors really felt it. I remember Emily and Geoffrey actually shed a tear because this wonderful little community was destroyed. It was really quite a poignant moment. Percival: I loved the color palette, which was based on peacocks that were part of a mural Simon had painted inside in the great hall. 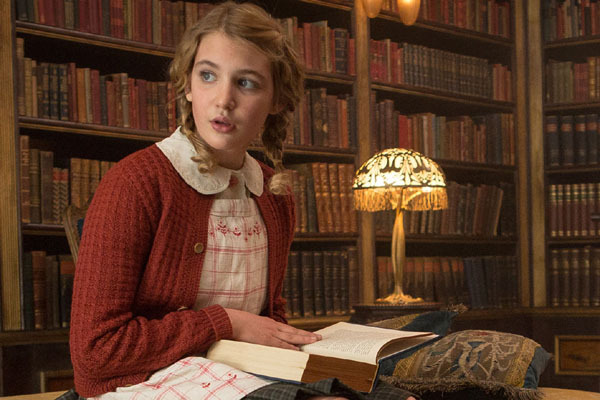 We envisioned when that couple would have completed the library for their son, and just put that room back 20 years from when the film was set. Art Nouveau was popular then, so we went in that direction. It did feel like an enchanted place with the stained glass windows, and all the different colored lights and lamps that Mark had incorporated among the walls of books. 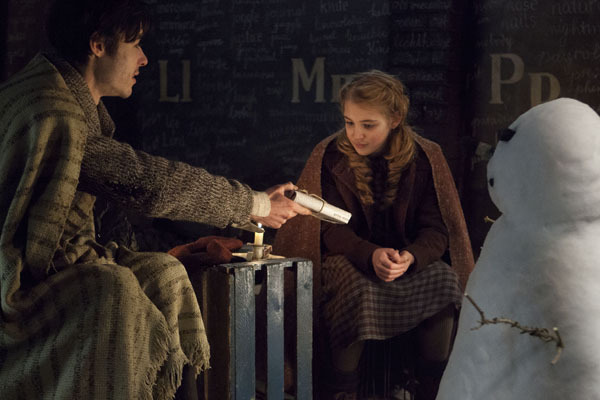 It became sort of a magical grotto that Liesel enters. She had never seen that many books before and she’s completely enchanted, it makes her want to read even more. There was something about them that made you want to open those books. You could almost smell the leather of the covers, the bindings. It’s a very exciting time for the character, a magical moment for her. So it was important that we did all those things to make it so. I think Simon and Mark did a terrific job, as did my stand-by lIsa McDaggert, who also was great throughout. Percival: I felt it needed to sum up a lifetime, but it shouldn’t be ostentatious in any way. 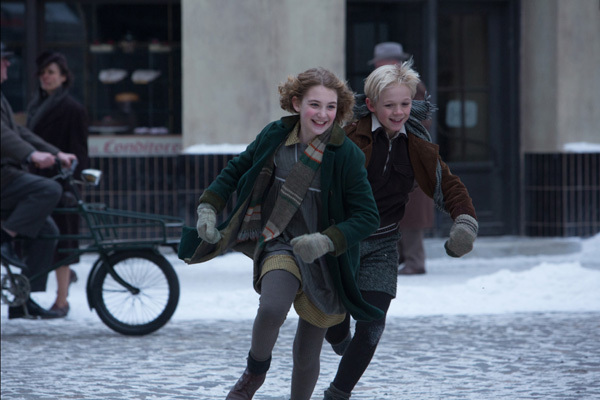 You know, Liesel lead a long and fulfilled life. She had real values as a child and that transferred up through her life, and so it was quite cultural, quite classical and reflected those things and people who had touched her life. I hope when people see the film, they feel the way I did when I read the book, and as so many other people have. It’s such a beautiful life-affirming story, it would be wonderful for more people to share it.